The What: Extron has begun shipping the SF 3PT, a pendant loudspeaker with a 3-inch, full-range driver for speech reinforcement and music playback in high-ceiling and open-ceiling applications. The What Else: Included with the SF 3PT is Extron’s PendantConnect speaker cable that combines the speaker wires and a steel safety cable within a single outer jacket, providing for a finished installation that is clean and secure. The UL-listed SF 3PT offers both direct 8-ohm and 70/100-volt operation and is voiced similarly to the Extron SF 3CT LP for sonic consistency in mixed-ceiling environments. "It’s been our mission to offer an elegant and aesthetically pleasing pendant speaker that blends well into sophisticated environments," says Casey Hall, vice president of worldwide sales and marketing for Extron. 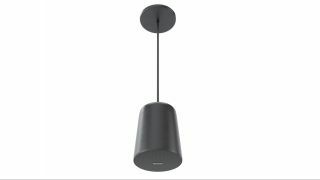 "Given the enormous amount of positive feedback we received at preview showings, it's no surprise these pendant speakers have quickly become the cream of the crop among our many speaker offerings." The SF 3PT pendant speaker comes with everything needed for a finished installation, including 20 feet of PendantConnect speaker cable. The Bottom Line: Taking inspiration from modern pendant lighting, the SF 3PT offers an architecturally clean, unobtrusive design that complements the aesthetic of contemporary interiors. The SF 3PT is available in black or white and is paintable to fit in with any décor.